BenQ released a new digital camera aimed at people that require both quality and fun in one camera. The compact BenQ DC-E600 digital camera features a 6 Megapixel CCD image sensor, 3x optical zoom, and a large 2.5 inch LTPS TFT display. The BenQ DC-E600 has a unique 2D-Rotating Lens-Eye and a PF mode, for Panoramic Focus. The Panorama Focus mode also helps you to get excellent results. 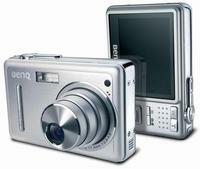 The BenQ DC-E600 digital camera also features a Trim and Sie function. When activated you are able to take a picture, cut the part of the picture you want to keep, or change the photo resolution/size directly. The compact BenQ DC E600 camera adds a dimension of fun to BenQ's digital camera line. - Shutter Speed: 1/2000~8 sec.